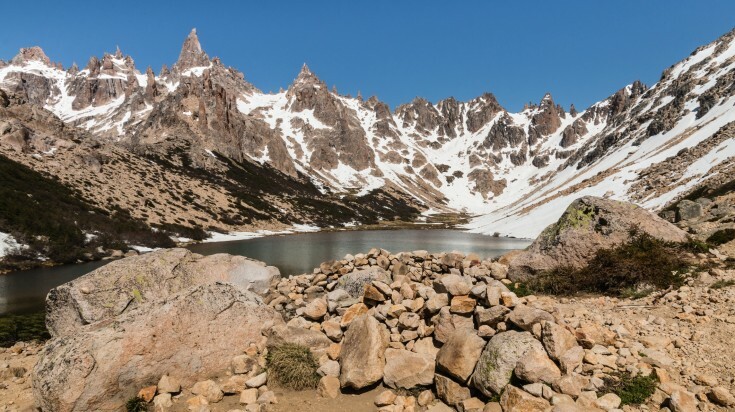 If you’re looking for a relatively easy trek with the rewarding views of exciting mountain peaks above the dense forest line, pristine lakes, and a quirky refuge at the top, the Refugio Frey hike is a must do. Located in the Nahuel Huapi National Park, you’ll cross streams over bridges, smell the clean fresh scents of the trees, and most probably meet some fellow hikers along this popular trekking route. With a few choices of routes to take, and options to do it in one day or spend more nights camping or in tents of lodges in the area, this Refugio Frey hike is one to experience. Families and most fitness levels are welcome! Incredible views of a gorgeous lake and jagged peaks around it. Easy hike, that is well-facilitated and well-marked. The hike is possible even in winter. It can become very crowded during high season. Hike difficulty: Easy. This is a gentle assent, not too steep except for a bit at the top. Remoteness: No. The trail itself is well-marked and during peak season there are always fellow trekkers on the trail. Best season: It is best to do this hike in late spring to early fall, which is October to April. Permits required: No permits or park fee required. The serene hike to Refugio Frey begins in the parking lot at the base of the Cerro Catedral ski resort, one of the most popular in South America. From the car park, the start of the hike is not far away. A wooden sign reading ‘Frey’ and a carved-out trekker sign is where the trail starts. The main trail is a short walk along the narrow path following the sign. The hike kicks off on a relatively flat terrain that goes through forests, winding through mountains. Pass small creeks along the way, walk over charming wooden bridges and marvel at the gorgeous views of blue lakes and mountain peaks that open up from the trail. About two or three hours into the trail, through aromatic, crisp forests, you arrive at a wooden cabin built under a rock — Refugio Petricek. The refugio has a wooden platform, allowing hikers to have a dry floor to sleep on. Since, Refugio Frey is only an hour away, it would have to be a real emergency for anyone to make this a stop. But it is still a great stop to catch a breath for the steep hike ahead. During winter, it is during this last stretch that you start seeing the snow. There is a final stream to be crossed from where you will see the roof of the refugio and the peaks of Cerro Catedral, calling to the end of the hike. 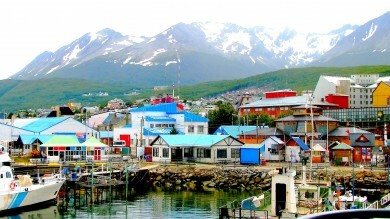 Refugio Frey sits overlooking Laguna Tonchek with Cero Catedral looming tall behind it. On arrival visitors can check in if you have made prior reservations. It’s just time to relax, use toilet facilities, and enjoy the scenic views. There are snacks, water, and congratulatory beers for sale here too. 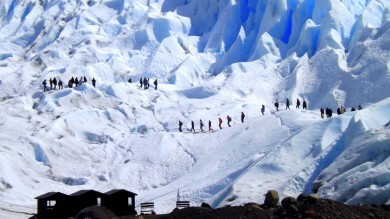 Instead of hiking to and back from Refugio Frey, there’s an option to make a round trip with Refugio Frey being a part of it. Start this trail with an ascend to Cerro Catedral by using the chairlift, for about USD 20*. The chairlift drops you off at the edge of the mountain, where a 3 – 4 hours’ hike along the ridge brings you to Refugio Frey. Along this route, you can see the Tronador Hill, the Valley and the Cascade of the Rucaco. Later, the descent to the Schmoll Lagoon begins, and finally to the Tonchek Lagoon, where the Frey refuge is located. It’s easy to reach the starting point from Bariloche. Just take the 55 bus with a sign saying ‘Villa Catedral’ on the front. The buses leave on an hourly basis, and takes you to the parking lot for Cerro Catedral in just 75 minutes. No matter what season, start the hike early in the morning to avoid being caught on the trails. Expect a frozen lake at Refugio Frey during winter. There will be fewer people and not a lot of shops will be open in the summer months, so take note of that. The campsite is free if you want to camp. Else, if you want to stay in the refuge, mattress can be hired for USD 14*. The refugio can house 35 – 40 people at a time, but reservation is mandatory and can be made at the Park Info Center in Bariloche. Snacks are available, but it is recommended to bring your own. The kitchen at the refuge is available to use for a small fee of USD 4*. You can refill your water bottle from streams along the way, but you may want to bring purification tablets to be safe. 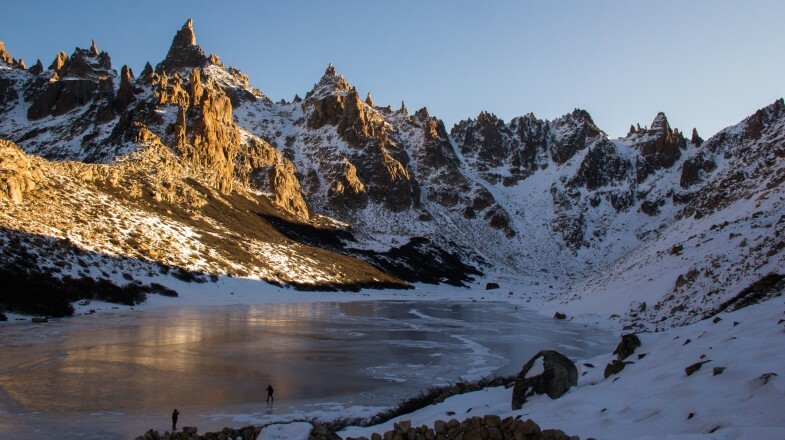 If you’re in Bariloche, the Refugio Frey Trek should certainly be on your highlight list. It’s accessible for all abilities and ages, and it’s free, so there’s no reason not to visit. Plus, the rewarding views of the peaks and the shimmering lake from the Refugio are some that will stay with you forever.